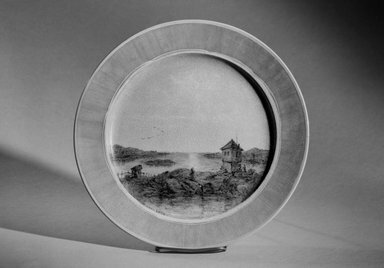 Porcelain dinner plate with yellow rim, plain blue border; white circular lines framing hand-painted polychrome scene consisting of square house on rocks, people in foreground, water in front of and back of house; other rocky islands in background. Blue skies, sun about to set. CONDITION: Good with extensive crackling.